The bird hide is a camouflaged shelter which is used to observe wildlife, especially birds, at close range. 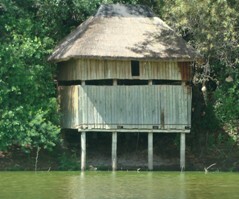 This bird hide is located alongside the Garden dam at the bottom of the Garden View Hiking Trail. It is surrounded by beautiful weaver birds’ nests which hang from karee trees – most of which were already mature when the Garden was established in 1967. It is a medium-sized hide fitted with a flat bench for sitting inside and can accommodate up to 5 visitors at a time. The bird hide window provides a magnificent view of bird species on the dam. This bird hide can be accessed by visitors at any time of the day and is designed to be accessible to people in wheelchairs. It is situated less than 200 m from the ticket entrance. 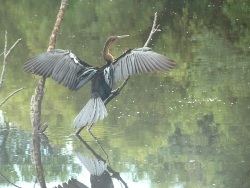 The beauty of the hide is that almost any kind of bird can turn up, from waterbirds to inland birds. As its location is at a natural-looking dam, it attracts a large selection of water and terrestrial birds such as Herons, King Fishers, Egyptian Geese, Cormorants, Coots, Red Bishops and Weavers. See the Bird List attached for a list of birds that you can anticipate to see at the Free State NBG. Bring your cameras and binoculars.